Does Your Store Have Endless Aisles? Retailers have had some challenges as technology and online retailers have created a more competitive space for all, including the brick and mortar retailers. Some have started to embrace the technology and keep shoppers in the stores by offering online ordering in store if you’re looking for something and can’t find it in the store. This is a great start, but some retailers have taken it a step further. Pier 1 allows customers to order an item that they cannot find in the store and have it shipped to their home for free. This is great, but it involves an employee assisting with this task. Kohl’s has taken it one step further and offers in store kiosks that allow customers to place online orders directly within the store. While this is a great method to use, according to this blog post, there are some challenges to it. 1. 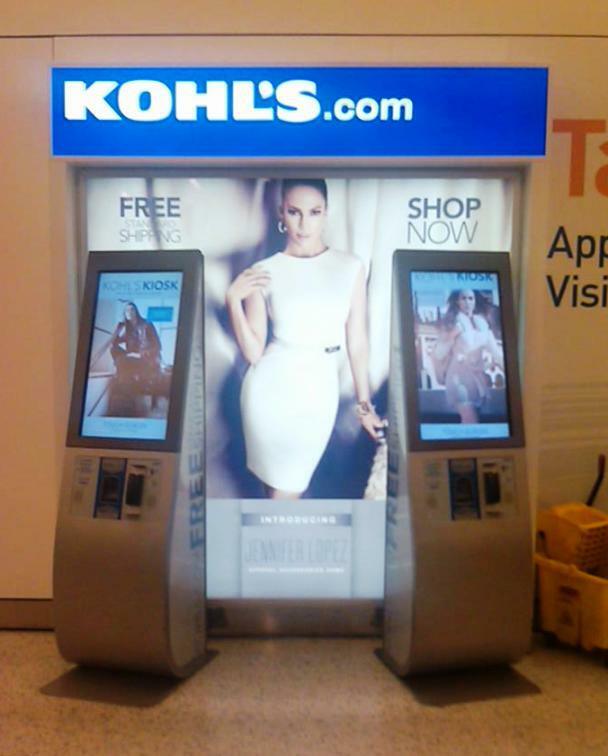 Providing enough kiosks to avoid waiting: according to the article above, Kohl’s offers limited kiosks, and there have been times when customers have had to wait to use them. As seen above, these kiosks are big and bulky, and according to the author, can be difficult to navigate, especially when entering personal information on the touch screen. These types of “custom built” kiosks share these difficulties. 2. Cost: the reason there may only be one or two strategically placed kiosks is due to cost. The custom built kiosks can be extremely costly, and because they are predesigned, they may be more difficult to keep updated. When problems happen, getting the kiosks repaired may be tricky. While retailers realize they are a much needed addition to their stores, there is a cost that may prohibit them from moving forward more aggressively. So, what’s a retailer to do? Start with the premise of providing “endless aisles” in a much more compact, cost efficient, robust manner. Turning to tablets and software to provide a seamless experience on a device that users are more comfortable with can be a game changer in retail stores. 1. Take out the middleman: Pier 1 (and other retailers) do offer the option to order online and have items shipped to your home. This involves interaction with an employee, and the right messaging in store to let customers know this is available. Unless a customer interacts with an employee and finds that this is an option, they may not know and leave the store empty handed. By offering interactive tablets in the aisles, customers can make purchases without needing additional employee assistance. 2. Go further than endless aisles: with the newer technology available for interactive tablets, retailers can do more than simply offer an online ordering system. For example, strategic placement near new items can encourage users to use the tablet to find the right product for their needs. If they want to learn more about a product, one tap of the tablet can show a quick advertisement or tutorial about the product, let the consumer read reviews, and more. 3. Grab data from customers in the moment of experience: while offering endless aisles, companies can make the most of their investment by asking a simple question or two while customers are shopping. This will not only give insight into the use of the interactive tablet, but you will learn more about your customers, especially those who are browsing and end up not making a purchase. This type of data is invaluable and increases the value of your endless aisles. 4. More cost efficient: because the interactive tablets are standard iPads enhanced with software, they are easily updated and managed, and the cost is less than a custom built device. Add to that the fact that the management of all tablets across locations can be done instantaneously, with little to no effort on the retailer’s part, and it’s easy to see why moving to interactive tablets is a great investment. With today’s technology, companies can also set up software to run different videos, products, or feedback type questions based on geography, department within the store, or any other criteria needed. As competition continues to be more of a concern, and customers becoming even more demanding, endless aisles will become commonplace in the near future. Utilizing an interactive tablet can be efficient and cost effective, and bring continued foot traffic into the brick and mortar locations, giving the e-commerce industry a run for their money.